When you order #72019, your Creatin' Contest entry form can be found in the order. For another form call customer service at 1.800.223.7171 or you may click here to print one out. We also accept online submissions through our online form. 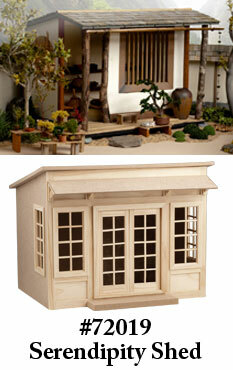 Start with #72019 Serendipity Shed Kit and let your imagination do the rest. Use this kit and products found in our catalog or on this web site (or other resources when needed). You may add to, modify, landscape or use any method you choose to create your finished project. Photograph your entry (see tips below) and submit no more than 4 high-quality, 4" x 6" photos that give an overall view of your project. No multiple-view photos, please. They will be excluded. Photos will not be returned. Do not use Polaroids or low-res digital printouts as they do not reproduce well. Be sure your photos are in focus! Entries will not be accepted unless accompanied by photos. Entries will be judged on originality, creativity and quality of workmanship. All entries become property of the contest sponsor. "Thank you" prizes will be awarded to all entrants! Do not use the flash on your camera. Instead, use full daylight or electric light sources aimed onto your project from two directions to eliminate most hard shadows. If the hard light is still causing shadows, aim the lights away from the project onto white sheets of foamcore or mat board; the reflected light will be much softer and more diffused. Outdoors, white boards can be used to reflect the sunlight up and onto your project in the same way. Clamp-on utility lights with aluminum shades are inexpensive, good light sources, and are readily available at hardware/home improvement stores. Use at least 100 watt bulbs (or about 1600 lumens in LEDs, for less heat). These portable lights can be clamped and positioned to provide good light for photos but be careful—they can get very hot! Remember, your photos are the only way we have to judge your project. All the time, effort and talent you put into your project will be wasted—in the eyes of the judges—by blurry, out-of-focus photos. Also, take care to frame your whole project in the viewfinder without cropping off a corner or the top, and try to avoid having distracting items in the background.